We design custom hydroponic systems scaled for your home, business, or restaurant. While there are many hydroponic technologies available, our stress is on designing systems that are easily maintainable and designed for ease of plant replacement. Especially where the look of the planted system is important (as in a restaurant for instance) the presentation is as important as the yield. This means that herbs, vegetables, and flowers at the end of their productive cycle must be easy to remove and easy to replace. Note that with our hydroponic systems there is exceptional yield compared with conventional soil based (i.e. raised-bed) systems. 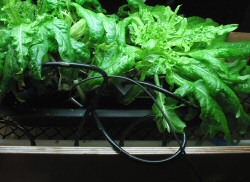 We design and fabricate two different types of hydroponic system. 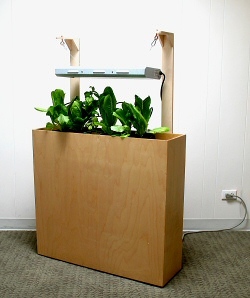 We prefer drip hydroponic systems for interior applications and flood and drain technology for outside hydroponic units. This technology is similar to that used extensively in commercial hydroponic herb and vegetable production. Plants are contained in plastic pots with inert media or individually in large rockwool "cubes". Nutrient is periodically delivered via pressurized drip tubes to each plant. Between nutrient feedings, the inert media supporting each plant partially dries allowing oxygen to reach the roots. Thus the plants receive optimal nutrition while being maintained in a high oxygen environment. The technology is very flexible as the plants can be fed with nutrient solutions tailored to the vegetative and flowering stages of growth. This technology is ideally suited for indoor growing systems. The system can be provided in a variety of materials and sizes and can be fabricated as modular units. Shown below is a self-contained drip unit in Icelandic Birch Ply suitable for a restaurant or interior application. 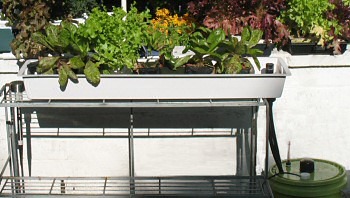 As shown, the unit can grow herbs (such as basil, lettuces, arugula, chard, chilies, and flowers such as marigolds and portulacas. Structural treatment: Icelandic birch ply with acrylic nutrient drip tray (shown). Can be fabricated in other materials. Nutrient Pumping System: submersible pump feeding valved delivery manifold to accommodate individual plant pots. Nutrient Reservoir: 3-1/2 gal with depth indicator and low-level pump shutoff. Please contact us from our contact page for further information. We can fabricate a modular flood and drain system for an outdoor installation. The system consists of one or more flood basins with inlet and drain ports. The basins are pump-fed intermittently from an external nutrient tank. The flood basins are designed to accommodate potted plants (vegetables, herbs, flowers) in individual plastic pots each containing inert support media. During nutrient flow, nutrient is wicked into the pots, thereby feeding each plant. This technique is very effective in supplying the nutrients that the plants need while allowing for root aeration during periods between successive irrigations. Nutrient Pumping System: submersible pump feeding valved manifold supplying basins. Nutrient Reservoir: sized for number of flood basins required (depth indicator included). 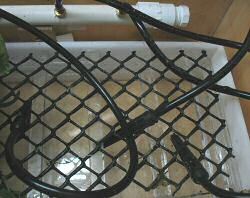 Flood and Drain system with one flood basin and welded steel support structure. Copyright © 2010-2013 ArtSciDesign, LLC. All rights reserved. All photographs on this site are copyright © 2007-2013 ArtSciDesign, LLC. All rights reserved. Plantechnicstm, The Floating Gardentm, Floating Gardentm, Kitchen Floating Gardentm, Floating Garden Kitchen Gardentm, Floating Garden Vegetable Hydroponic Gardentm, Floating Garden for Pondstm , Grass Gardentm, The Grass Gardentm, Just Add Watertm, Lettuce & Herbstm, and From Your Floating Garden To Your Tabletm are trademarks of ArtSciDesign, LLC. Certain of our technologies are utility patents pending and are incorporated in our products. Product specifications are subject to change without notice for product improvement.